Tesla Motors CEO Elon Musk has more than just one plan to make it possible for electric car motorists to drive across the country. Musk took to Twitter Tuesday to say the company will demonstrate its battery-swap technology Thursday night at Tesla's design studio in Hawthorne, California. The swap demo comes just weeks after Musk said Tesla would triple the number of supercharging stations across the U.S. in 2013, including stations in most major metropolitan areas. Tesla plans to post its technology demo to the company web site on Thursday at around 9:30 p.m. PDT. Battery swaps for Tesla cars have been hinted at for some time. The Tesla Model S was designed with battery swaps in mind. In May, Musk said, again via Twitter, there was a way for the Model S to be "recharged throughout the country faster than you could fill a gas tank." But the most obvious admission came in late March when a Tesla filing with the Securities and Exchange Commission said the company planned to create swapping stations. Swapping out "the Model S battery pack and the development of specialized public facilities to perform such swapping," could increase the adoption of electric cars, Tesla noted in its first quarterly report for 2013. Tesla said it did not currently have swapping stations available, but the company planned to introduce them in the near future. Battery-swap stations, along with the company's superchargers, would reduce worries about long-range driving in electric cars. The last thing you want to have happen with an electric car is to run out of power in the middle of nowhere with no way to charge up and keep moving. Beyond the battery swap demo, additional announcements are planned for the company event on Thursday, a Tesla spokesperson told TechHive. The representative declined to go into further detail, so it's not clear if Tesla's event includes plans to deploy swap stations across the country. 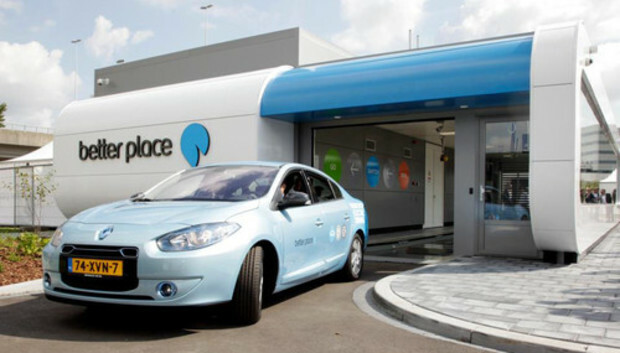 Another question is what Tesla's battery-swap technology will look like; however, we can get a pretty good idea of what Tesla might offer based on demonstrations by Better Place, an Israeli-founded electric car start-up that recently applied for liquidation. Here's a look at Better Place's battery-swap technology in action. The basic idea of Better Place was to create generic battery-swap stations for electric cars via trial markets in Denmark and Israel. A car would drive onto a platform similar to an oil-change shop where the underside of the chassis is accessible. Then a robot in the pit below would take out the discharged battery and replace it with a fully charged pack. The process took less than two minutes from start to finish. Despite a hopeful and much-hyped start, Better Place shuttered at the end of May after failing to acquire further venture-backed capital to continue operations. The company ultimately lost just over $800 million due to the infrastructure costs of setting up charge stations, poor support from car manufacturers, and a tepid response from the public. Tesla recently reported its first-ever quarterly profit, so it's unlikely the company would suffer the same fate as Better Place. Nevertheless, to deploy a network of swapping stations will still carry a heavy cost, and it will be interesting to see how quickly the company can deploy swap spots across the U.S.